crawling out of his crypt and to the steel city for the first time in four years! set to destroy, never on stun. Modular based Industrial Techno from Greg VanEck . (Prometheus Burning, Four Pi Movement). Odd swings, modular beats and broken riddims. cosmic fest is a four day long-weekend of both dance and experimental oriented electronic events coordinated by an array local promo crews. 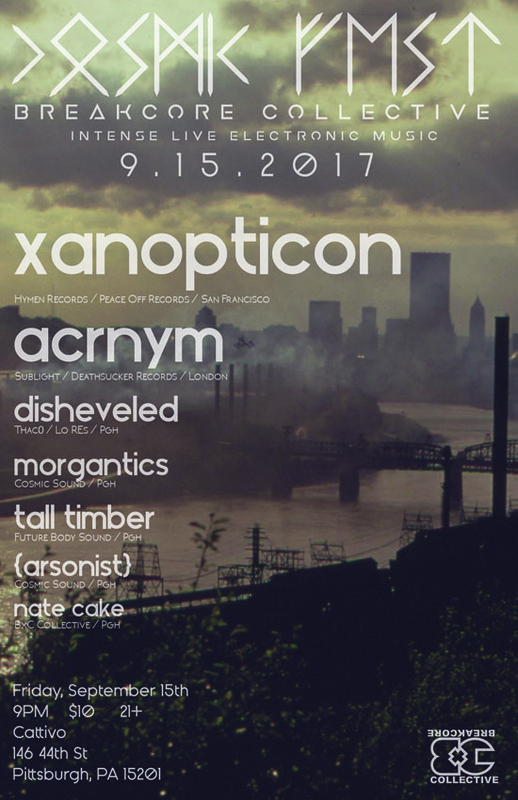 the inaugural fest is sept 14-17 2017, in pittsburgh, pa.
bxc collective is a group of friends, artists, music fans and weirdos dedicated to showcasing heavy, boundary pushing live electronic in pittsburgh, pa.